Restrained discretionary spending likely induced by increased payroll taxes generated weaker than expected retail sales performance in March; a sharp drop off from the solid numbers posted in the prior two months. However, the coinciding downshift in the labor market and decelerating income growth lent little foundational support for consumption. The discretionary sectors most adversely affected in March included auto sales and department stores, while housing-related sectors, such as furniture stores and building materials reported increased sales, likely due to strong gains in the housing market. March retail and food sales totaled $418.3 billion, representing a -0.4 percent decrease from February, but still 2.8 percent above year-ago levels. 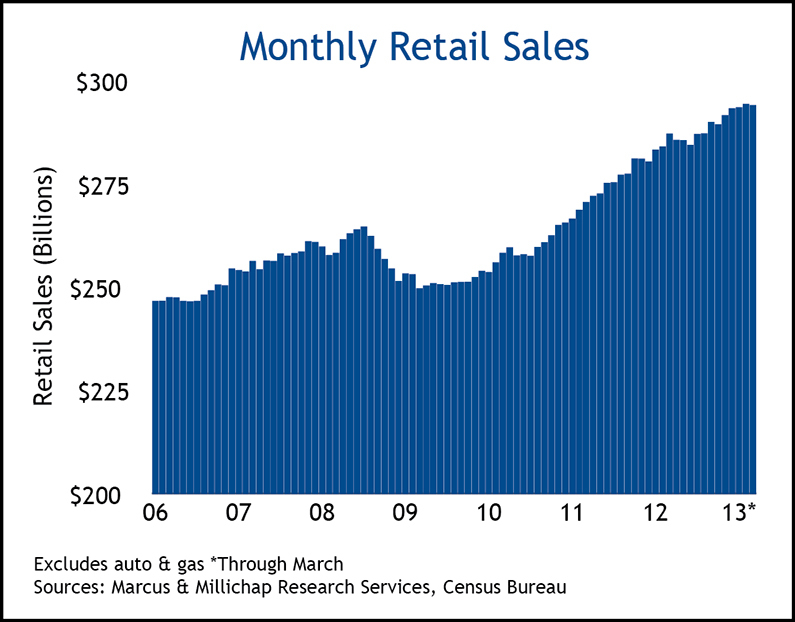 Core retail sales, excluding autos and gasoline, flattened to -0.1 percent, and remain 2.4 percent higher on an annualized basis. Gasoline stations, electronics and appliance stores, department stores and motor vehicles reported the most significant monthly declines, ranging between -2.2 and -1.6 percent for gasoline and electronics, respectively, to -1.1 and -0.5 percent for department stores and autos, respectively. Non-store retailers and motor vehicles maintain the strongest annualized gains across categories, posting 13.5 and 7.4 percent, respectively. Conversely, department stores and electronics and appliance stores report the largest decline in revenues on an annualized basis of -7.6 and -3.2 percent, respectively. Sequestration, higher taxes, an overriding theme of slower demand, and noisy threats from North Korea joined in re-igniting the familiar drumbeat of economic and geo-political uncertainty. However, rising residential construction and home sales, which are critical to the health of the consumer sector and overall economy, supported economic resilience to the persistent headwinds. The Conference Board’s index of leading indicators continues to reflect widespread improvement, notwithstanding weakness in consumer expectations and manufacturing new orders. The deceleration in industrial production and other economic factors that influence demand for industrial properties present heightened risks for the sector’s near-term performance. Thus far, however, distribution, warehouse and manufacturing space exhibit impressive leasing and rent growth momentum, aided by low levels of supply. Vacancy is forecast to tighten by 80 basis points to 8.6 percent by year end. The long-run strength of e-commerce could contribute significant demand for centrally located distribution and warehouse facilities going forward. Demand for retail space remains limited, but has managed to outpace the dearth of new supply, expected to total 55 million square feet by year end. A key factor that will support brick and mortar retail in the coming year is the passage of the Marketplace Fairness Act, which compels states to tax online retailers at a rate comparable to other retailers. This change will level the playing field by eliminating the 5 to 10 percent pricing advantage long held by online stores. Forward projections call for a further decline in vacancy to 8.6 percent by year end and effective rent growth by year end of 2.1 percent. This entry was written by marcusmillichap, posted on April 18, 2013 at 12:14 am, filed under Research and tagged Commercial Real Estate. Bookmark the permalink. Follow any comments here with the RSS feed for this post. Trackbacks are closed, but you can post a comment. Please translate into retail sales per square foot of occupied space. Fantastic website you have here but I was curious if you knew of any discussion boards that cover the same topics talked about here? I’d really like to be a part of community where I can get opinions from other knowledgeable people that share the same interest. If you have any suggestions, please let me know. Thanks a lot!